You are here: Home / Crochet Other / Affiliate Posts / 33% Off and Free Shipping! 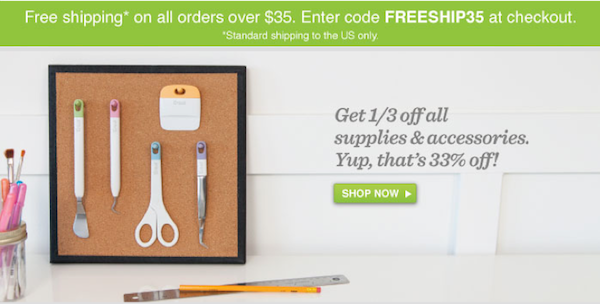 33% Off and Free Shipping! Cricut is taking your summer cutout crafts to the next level! From now through June 24th, get 1/3 off of all digital images and $10 off on Cricut Cuttlebug Machines! Now is the perfect time to stock up for your summer projects and maybe even get ahead on your Christmas creations. Shop now and get free shipping on all orders of $35 or more*, when you use the promo code: FREESHIP35 at checkout. Invitations, tee shirts, tableware, wall murals… this summer jumpstart your cutout art at Cricut. $10 off on Cricut Cuttlebug Machines! *Please note some location restrictions apply to the free shipping promo – i.e. Standard shipping to the U.S. only.